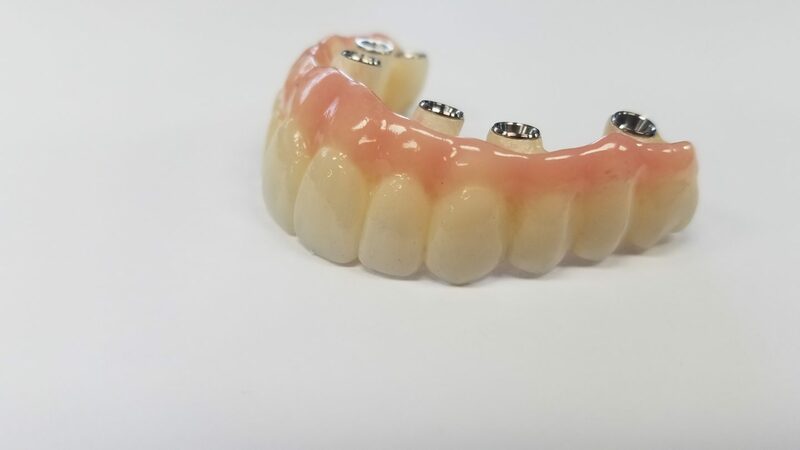 When clearance does not allow enough retention for a cement-retained implant restoration, or the doctor requires retrievability, a screw-retained crown or bridge implant restoration can be made. A PFM screw-retained restoration requires the use of a UCLA castable abutment, on which the plastic sleeve is adjusted and then waxed by our technicians. The abutment is waxed to include the ideal crown (or bridge) metal substructure design to properly support the porcelain. 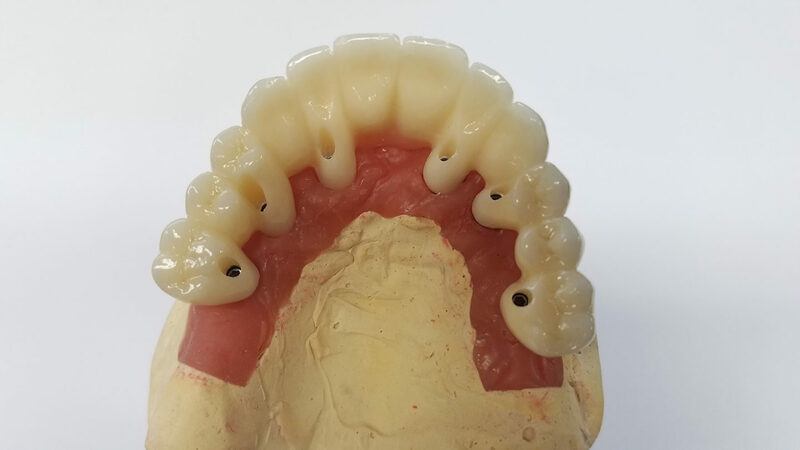 Once waxed as desired, the abutment is cast, opaqued, and stacked with porcelain like a standard PFM. An all-ceramic screw-retained restoration requires the use of a titanium base designed for hybrid abutments and screw retained units. The crown (or bridge) is made using zirconia or emax that is then cemented by the laboratory to the titanium base(s). Global Dental Solutions can utilize both full contour and layered options for the zirconia and emax screw retained restorations. A PFM screw-retained restoration requires the use of a UCLA castable abutment on which the plastic sleeve is adjusted for proper height and margin location. 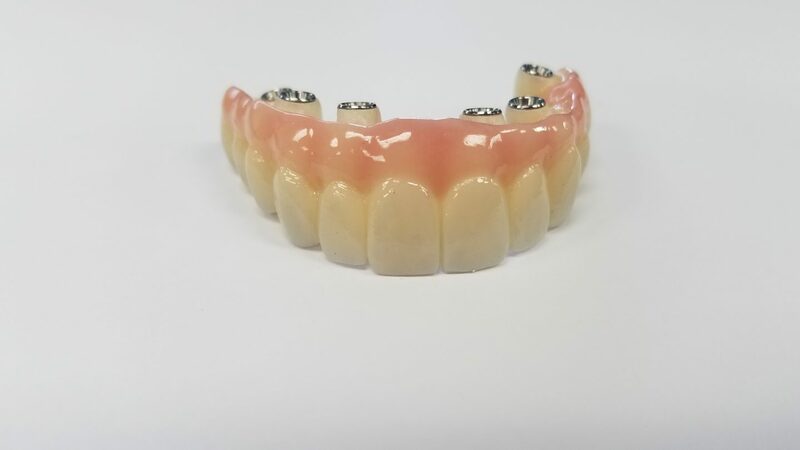 Then, our technicians add wax to the abutment until the metal substructure is designed to support the porcelain the ideal crown or bridge porcelain contours. 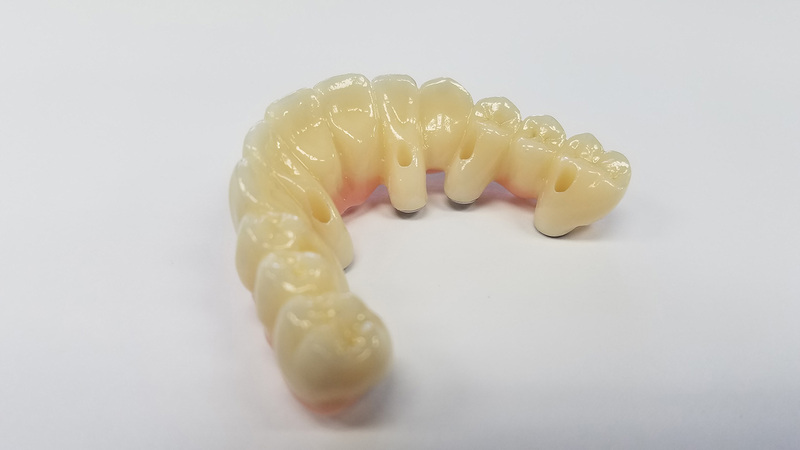 Once waxed as desired, the abutment is cast, opaqued, and stacked with porcelain like a standard PFM. An all-ceramic screw-retained restoration requires the use of a titanium base designed for hybrid abutments and screw-retained units. 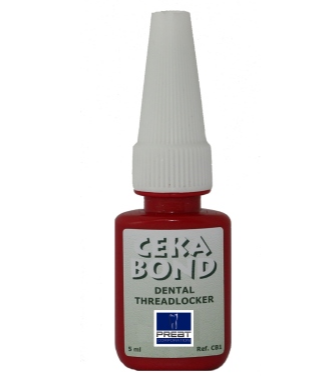 The crown (or bridge) is made using zirconia or emax that is then cemented by the laboratory to the titanium base. Global Dental Solutions can utilize both full contour and layered options for the zirconia anscrew-retainedetained restorations. Our lab technicians cement the crown or bridge to the titanium base(s) before finalizing the case for delivery to the clinician’s office. 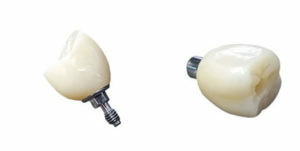 Screw-retained full zirconia bridges are fabricated from a single piece of zirconia. Only the nonfunctional tissue areas are layered with porcelain to achieve a natural tissue appearance. 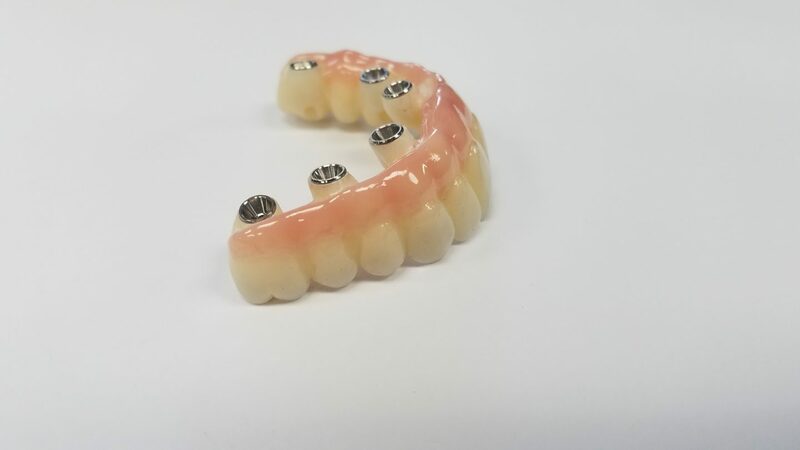 Once an accurate bite registration is taken and verification jig is confirmed, we will fabricate a wax setup for try-in and approval. At that time, the aesthetics and function are approved, or changes are requested. 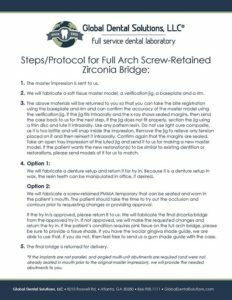 Upon approval, the screw-retained full zirconia bridge is milled, stained and sintered, the porcelain is applied to the tissue areas, and then the entire bridge is further characterized with stain. 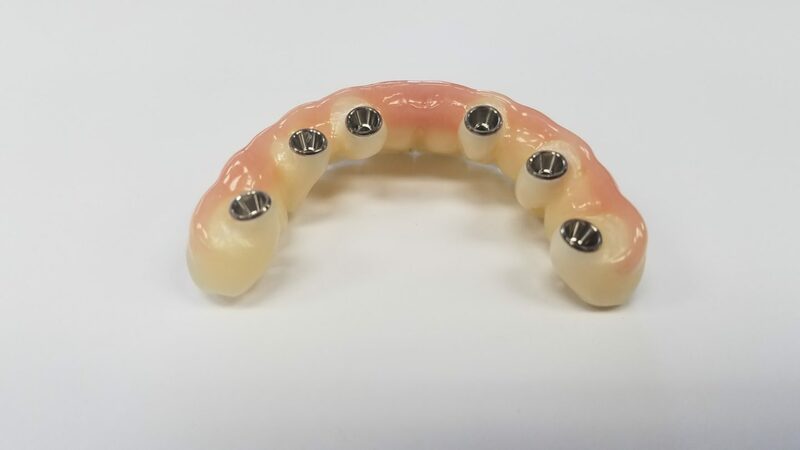 Once complete, the titanium inserts are cemented inside the bridge and titanium abutments are provided with the bridge for delivery. Abutment-screw loosening has been shown to be the most common dental implant prosthetic complication. Read the article at right for more information about the causes and prevention, as published February 22, 2018, by Dr. Randolph R. Resnik in Dentistry Today®. 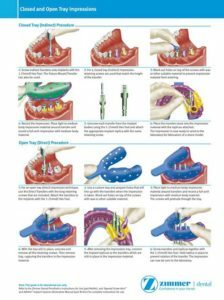 Please click on the file to download an illustrated guide to closed and open tray impression techniques for implants, courtesy of Zimmer. For dental offices using the closed tray technique, please take special note of step six. You do not need to place the indirect transfers (impression copings) into the impression prior to sending it to us. If you send the transfers separately in a plastic crown box or in a sealed pouch, we will place them inside the impression under our microscopes to ensure precision and accurate placement. Discover the right solution with our fabrication team. Contact Global Dental Solutions today to learn more. Contact our team today to find the right solutions.